The charming and appealing balcony-suite (65sqm) is located in Alstertal, in the north of Hamburg, in the popular district of Poppenbüttel. The spacious balcony is equipped with a beach chair and patio furniture. From the hallway you enter a modern and refurbished designer shower room with exterior window and granite floor, the walls are tiled in marble. V. M.
The new separate and attractive kitchen also has an outside window. The tall cabinets have plenty of storage space, the equipment is extensive and leaves little to be desired. The apartment has a quiet bright bedroom with double bed and access to the balcony. 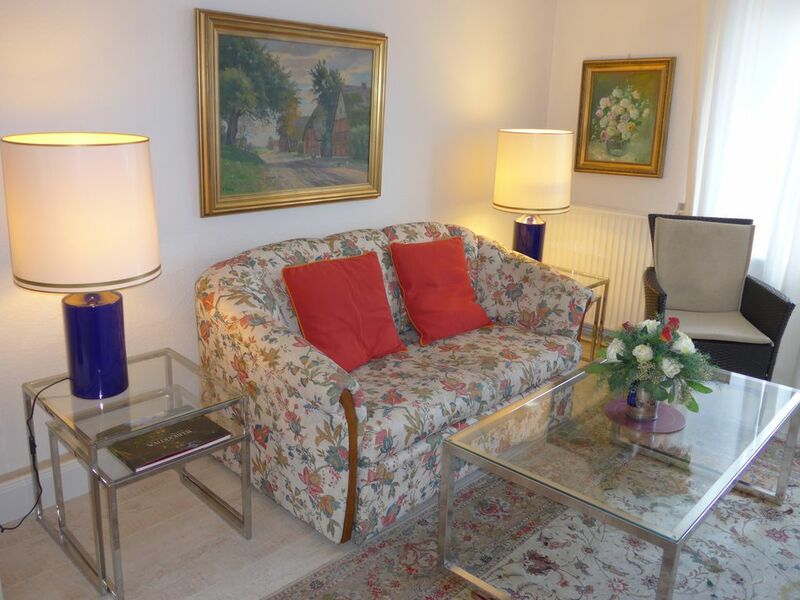 There is a sunny and cozy living room with elegant living area and a. a mahogany secretary, appealing pictures etc. Another bed with electric motor is in a sunny niche. A cozy dining area and a welcoming seating meet high standards. Parking and Wi-Fi are available for free. Its location in the Alster Valley is a challenge for golfers. The place can be reached by car in 5 minutes. Golf guests are welcome. There are golf taster u. V. M. offered. Located close to the city, the beautiful place impresses with the proximity of nature. In the living room there is something hidden in an alcove another bed for the third and fourth guest. Sleeping on a sofa bed is not required, as are no-way and moving furniture table and chair. The new high-quality kitchen cupboards. It also has a large exterior windows with glazing bars. It is extensively equipped. A boat rental and the Alster are 400m away. Beautiful scenic walking paths offer relaxation. An attractive top-selling mall, the AEZ, is just a 10-minute walk along the Alster lock over, with a high quality and diverse shopping offer. If you are a golfer, the golf course Treudelberg (18 holes) is 2 km away. The balcony suite offers by its position much nature and relaxation, but by good transport connections to bus and S-Bahn within 35 minutes at the main station to sightseeing, cultural events, musicals etc wahrzu- take. This apartment is one of six in this pleasantly placed house in Poppenbeuttel. The kitchen is very well-equipped with such things as salt, oil, baking paper and plastic bags. The cooking equipment was brilliant and there was nothing else I would have wanted. The bedroom was comfortable and has good storage.Everything was well-maintained and Ulrich & Ulrike were very pleasant hosts, who do speak English. They lent us their bikes which meant that we could explore the area very easily. The park by the Alster river is very large with great paths for cycling or walking, and it's a lovely ride into Hamburg along the river. Very good transport network and bus stop is only a few minutes walk from the property. Do look at HVV Group tickets if there are two or more of you as you can save a lot on the cost of tickets that way. We didn't hire a car and the jorney to Hamburg Airport is very easy. The shopping centre described is amazing, very large and worth a visit. Edeka, Aldi & Penny Markt all within easy walking distance, some restaurants, cafes and bakeries (including the beautiful cafe Rheinhardt's) and a few shops. Would recommend this apartment. Sehr gute, freundlich und hell ausgestatte Wohnung. Ruhige Wohnlage, zentral gelegen. Eine sehr schöne Wohnung , sehr geschmackvoll eingerichtet . Wir haben uns wie zuhause gefühlt . Die Wohnung ist mit viel Liebe zum Detail gemütlich eingerichtet und man fühlt sich sofort willkommen. Es ist an alles gedacht, was man benötigt; die Küche ist zwar klein, aber super ausgestattet und auch Besteck / Geschirr / Gläser sind reichlich vorhanden. Die Vermieter wohnen im selben Haus uns sind bemüht, daß man sich immer wohlfühlt. Die Wohnung liegt ruhig und mit Blick ins Grün, trotzdem sehr zentral (S-Bahn in die Innenstadt 3 Busstationen entfernt oder 25 Min. zu Fuß über den Alsterwanderweg). Nächster Supermarkt ist 5 Min. entfernt, das sehr schöne Alstertal-EKZ 20 Min. zu Fuß oder 2 Busstationen. Durch die Lage hat man die Möglichkeit, gut die typischen Sehenswürdigkeiten Hamburgs zu erkunden oder auch weniger Bekanntes, aber mindestens so Lohnenswertes, wie z.B.das grüne Alstertal. Ich kann die Wohnung empfehlen und würde jederzeit wiederkommen. Der Aufenthalt hat mir sehr gut gefallen ! Eine sehr schön und stilvoll eingerichtete Ferienwohnung im ruhigen Stadtteil Poppenbüttel war für uns ein toller Standort um die Stadt Hamburg zu erobern. Verkehrsgünstig gelegen, mit lieben Leuten als Ansprechpartner im Haus.... wir kommen gerne wieder. Europe's most successful shopping center, the AEZ; can be reached on foot by the Alstertal in 10 minutes and invites you to shop and stroll. Wellness, boat rental, bicycle tours, Nordic walking, the nature reserve Raakmoor, the Duvenstedter Brook u. a. lie in the close environment. The area offers a lot of variety such as nature and tranquility, but also the proximity to the city for theaters, operas, musicals, museums and other cultural experiences. Other Activities: boat rental to paddle on the Alster, bike rides along the Alster, u. a. to the city center. Cultural events in the nearby Alster-Schlösschen, also known as Henneberg Castle. Wäschepaket €10,00/je Gast/ Ein Kinder -Reisebett und einen Kinder-Hochstuhl stellen wir kostenlos zur Verfügung, Ein Internet-Zugang über W/LAN kann kostenlos genutzt werden. Eine Münz-Waschmaschine und ein Münz-Trockner können genutzt werden. Für Ihren Hund berechnen wir €10,00/je Nacht Kulturabgabe der Hansestadt Hamburg €1,00/Nacht/je Gast ab 18 Jahre.